EVER since it was first indicated that the static present in the output of radio receivers was due in part to physical disturbances on the sun a new field of research has attracted popular scientific interest. It is radio astronomy, whose equipment and observers listen not to man made responses, but instead to continuous “static” from the stars. 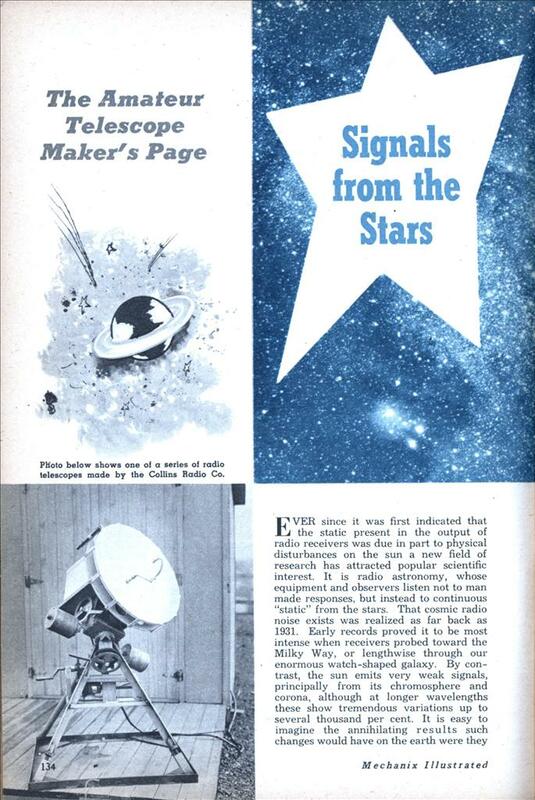 That cosmic radio noise exists was realized as far back as 1931. Early records proved it to be most intense when receivers probed toward the Milky Way, or lengthwise through our enormous watch-shaped galaxy. By contrast, the sun emits very weak signals, principally from its chromosphere and corona, although at longer wavelengths these show tremendous variations up to several thousand per cent. It is easy to imagine the annihilating results such changes would have on the earth were they at the visible portion of the spectrum. Yet in terms of total solar radiant energy, the effect of radio waves is insignificant. Radio astronomy differs from the visual in two principal ways. First, of course, is the fact that we are studying unseen phenomena—radiation at wavelengths much longer than that detectable by the eye. And, second, instead of lens systems and photographic plates, very sensitive radio receivers teamed with high resolution antennas are used to make the observations. Current television stations operate from 1.39 to 1.75, and 3.4 to 5.5 meters (the latter, channels 2 to 6). The FM radio band lies in between, covering 2.8 to 3.4 m. But standard AM broadcasting transmits from 180 up to 550 meters. For example, WNBC New York, at 660 kilocycles on the dial, has successive wave crests separated by approximately 1,500 feet, nearly as high as the Empire State Building, all racing toward listeners with the speed of light. Up to the present time radio astronomy investigations have been confined to measurements at wavelengths between 3 mm. and 20 meters. At the shortest wavelength the successive wave crests are separated in space by about twice the thickness of a penny. The instruments used for celestial microwave study, while resembling reflector type telescopes in appearance, differ considerably in operation. Moreover, weather clouds which prevent optical work will not appreciably interfere with the collection of stellar radio data. This was vividly demonstrated at Attu, Alaska, on September 12, 1950, when the Naval Research Laboratory’s expedition successfully recorded a total eclipse of the sun during a rainstorm. But in resolving power, radio telescopes cannot equal conventional ones because of the much longer wavelengths used. Since radio astronomy itself is a comparatively new field, where the tools and observing techniques are still undergoing modification, definite conclusions regarding the cause of noises heard from out in space would be premature. Interesting is the fact that none of the brighter stars we see in our sky contributes much in the range of radio waves. Just as advances in terrestrial nuclear _ physics have explained the heat and behavior of stars, they also aid scientists in formulating theories on the origin of cosmic rays. Some years ago, it appeared plausible that loose electrons in interstellar space sent out radiations as they sped past protons or other heavier particles. The more modern idea, however, proposes that some unusual stars of lower than naked eye luminosity and temperature may be responsible. Stronger emissions from the summer constellation of Sagittarius, toward the center of our galaxy, suggests a concentration there. Exploration of the universe has thus been vastly expanded with the growth of radio astronomical apparatus permitting study of celestial radiation at frequencies never before investigated. Who can predict what great and hitherto “invisible” objects will be discovered?